There are two sounds you cannot escape in Dubai: the call to prayer ringing out from the city's mosques five times a day and the 24-hour clunking and grinding of construction. The city is home to some of the most ambitious buildings in the world: the tallest tower block; the world's first seven-star hotel. There are even plans to build a ski-slope in the middle of the desert state. But there is little glamorous about the building industry itself. 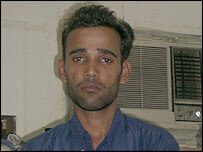 Staffed mainly by South Asian migrant workers, it is a 24-hour operation, run from specially-built labour camps. This is the story of a suicide. 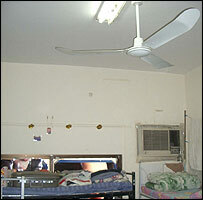 Arumugam Venkatesan has hanged himself from the ceiling fan in his room in his labour camp. His room-mate, Avdesh, is easy to miss in the small, crowded house on the outskirts of Dubai. Still shaken from the death of his 25-year-old colleague, he is withdrawn and speaks quietly. The first thing he shows me is the luggage piled on Venkatesan's bed. A small collection of bags and battered suitcases, awaiting collection. "I came home from work at around 7.30pm," he says. "The room was locked. When we opened it, it was in darkness. I called out to Venkatesan, but he didn't answer. Then I saw his body hanging; his knees were on the floor and his neck was broken." 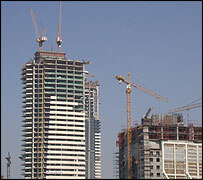 Thousands of labourers and electricians arrive in Dubai every year from South Asia. Venkatesan's arrival was typical: he had been brought from India by a company supplying workers to the construction industry. He was reliant on them for the right to live and work in the Gulf and he lived in a labour camp provided by the company - 85 men in a nine-roomed house. The bedrooms sleep eight, sometimes 12, people. The bathrooms are squeezed into cupboards and are shared by 25 men. The conditions are basic, but there is a reason why people like Venkatesan come to Dubai: money. A construction worker here can earn up to 10 times what he would get in India. For many, it works out well - families back home are supported, houses get built, debts are paid off. Business may be booming for Dubai, but Avdesh tells me he has not been paid since August and that many of his colleagues are working without proper papers. "This gentleman over here," he says, "hasn't had his visa renewed and he's now working illegally." It is alleged that some companies take passports and "lose" them so workers cannot return home. Venkatesan took out a high-interest loan to pay the fee asked by the company for bringing him to Dubai. He was the sole breadwinner in a family of six. His workmates showed me a photocopy of what they said was Venkatesan's suicide note. It explained, they said, that he had taken his own life because he had been unable to pay back his loans. Regis Johns is the manager of the company that brought Venkatesan and his colleagues from India. I asked him why the salaries had not been paid. "Our company has gone through certain financial crises for the past one and a half years," he says. "We said we'd definitely pay them. In fact, we offered them two months' salary the day before yesterday." Mr Johns admits the company holds all its employees' passports - a common practice in the UAE even though it is illegal. It is also illegal for workers to strike, which means the employees of Mr Johns' company are being asked to work without pay and without the documents to return home. But Mr Johns rejects any notion that this amounts to slave labour. "We're against any kind of slavery system here," he says. "I can show you the document they signed before coming here, which states the hourly rate, the terms and conditions of the systems out here. They willingly sign this - and only then do we process their visas to come." Mr Johns denied the company kept employees in the country against their will and said it was working hard to find the money for the missing salaries. He also pointed out that salaries are paid two months in arrears, so the workers have only relatively recently been made aware of the company's financial crisis. But since Venkatesan's death, Avdesh says many of the workers now want to cancel their contracts and return home. "I heard a lot of things about Dubai," he says, "about how great it was. But when I came here, I hated it. "I don't ever want to come back here. My family is pleading with me to come home: 'whatever condition you're in, they tell me, just come back'."